I’ve been a published writer since 1982 when I worked as a freelance writer for Christian magazines. At Catholic Digital Resources, I freelance for you. You are the publisher. I offer a large and ever-increasing variety of written materials, and if you ask for something that I haven’t produced yet, I get right on it and tailor it to your parish or situation. I converted to the Roman Catholic Church in 1977, drawn in by the Eucharist, and I have been studying Catholic teachings ever since. I have a Degree in Theology (B.Th.) and have been certified by the Diocese of Trenton in Pastoral Administration (1992) and by the Lay Pastoral Ministry Institute of the Diocese of St. Petersburg (2003). Active in ministry from the start, I’ve served the Church in a wide variety of parish and diocesan ministries, including as staff writer for a diocesan newspaper. I have worked as RCIA Director, Evangelization Coordinator, Coordinator of Adult Religious Education and developer of Small Christian Communities (in some cases pioneering it as a new program of the parish). Since 1996, when I took my earliest steps onto the Internet for the sake of Catholic evangelization, I started my first website (Good News Ministries) and began campaigning for the Church to make full use of digital technology. I designed the first website of our local Catholic radio station and then started my diocese’s first website. While promoting the value of parish websites, I was contracted to produce a few of them, including the cathedral of the Premier See of the U.S., the Cathedral of Mary Our Queen in Baltimore. And I formed the Good News Web Designers Association to help other Christians do their very best in the use of this technology. 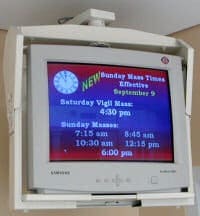 When I visited a church in 2001 and found monitors greeting people as they entered for Mass (in addition to human greeters, of course), I thought: “Here’s a church that gets it!” The monitors displayed a PowerPoint slide show of upcoming events (see photo on right). How innovative! What an excellent idea! 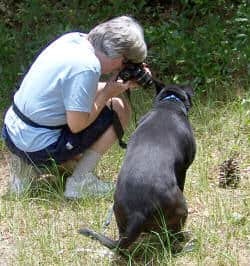 A camera buff since a small child, I became a professional photographer in early adulthood. In early internethood, I began promoting the use of really good photographs on parish websites, not only as eye candy for the website visitor, but more importantly as an evangelization tool. My virtual tours of the churches that hired me were crafted into an experience of faith, taking the tourist not only through the building but also the beliefs of our faith. As digital technology continues to mature and multiply and become less expensive, I’m always seeking, testing, and finding ways to utilize it for the Church in her faith-building, faith-spreading mission. While working on staff in my parish, as Evangelization Coordinator and RCIA Director, I produced pamphlets, PowerPoint presentations, and slide shows that I’ve dubbed “Multi-Media Meditations”. I soon realized that there were no Catholic publishers offering anything like this. So I gave up my weekly paycheck to start Catholic Digital Resources™. Here you’ll find faith-enrichment materials in an ever-expanding variety of products, ready for you to download and start using at the click of a link. Paper products are provided as digital files ready for you to print on an as-needed basis. You can even put your church’s (or organization’s) logo, name, Mass schedule, contact information, or other notice into an editable box on the page, before printing. Explore this website to find out what’s here. I hope it will inspire new ideas and innovations for your ministry. If you don’t see what you’re looking for, let me know. I also produce on-demand materials; for example: program booklets for special Masses that the harried parish staff is too busy or too untrained to do well, PowerPoint slide shows of your parish activities to show to new members, and …. well, the ideas are endless. That’s the beauty of digital publishing. It’s very dynamic. Everything sold by Catholic Digital Resources is doctrinally sound, in keeping with the Magisterium of the Roman Catholic Church. See our Ecclesial Approval. St. Isidore of Seville is the Patron Saint for Catholic Digital Resources™. Do you know Terry Modica through Good News Ministries? Good News Ministries of Tampa Bay, founded by Terry and her husband Ralph in 1995, is a non-profit charitable organization that relies on donations to support its work. Catholic Digital Resources was founded in 2007 because clergy and parish staff began asking to buy distribution licenses for GNM’s reflections and other resources.